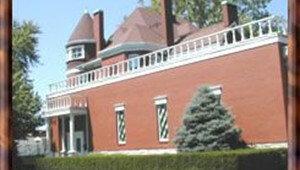 Built in 1893, the George Von Weise Mansion serves as the home to the Donnell-Wiegand Funeral Home since 1952. At a cost of $8,000 in 1893, the home was made with separate turret designs, 4 fireplaces, 3 false, servant quarters, hand-painted dinning room mural and built in warmers for food in the radiators. Also in 1893, W.D. Donnell started a business, W. D. Donnell Furniture and Undertaking. Four generations later, the business is still serving the families of Bond County. The addition of a ground level chapel in 1978, we have added a spacious, comfortable chapel for our families during visitations and funerals. A private family room and private family parking in our heated garage are two examples of the high quality we offer to our families.